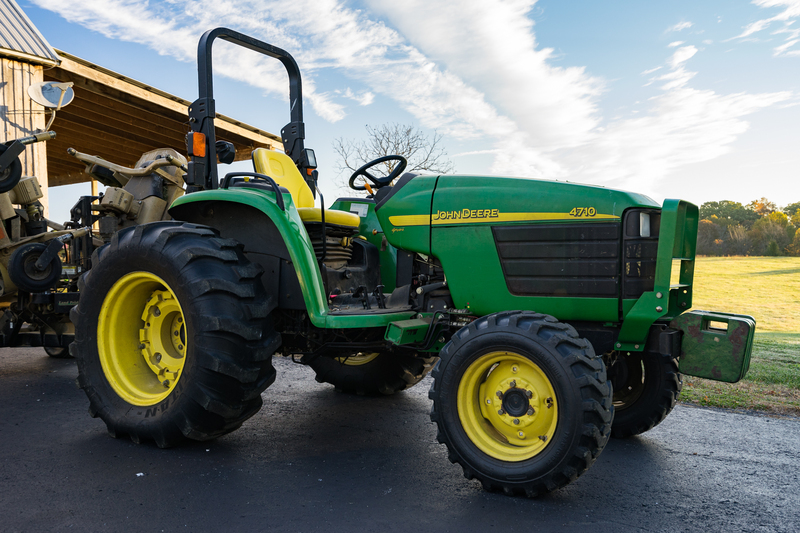 Wayne Personal Property Auction — Harritt Group, Inc.
Jody & Jerry Wayne have sold their Floyds Knobs’ farm and will sell 2 tractors, equipment, Ford pickup truck, tools, antiques and household items. Auction located 1.5 Miles East of Hwy. 150 and 5 Miles North of Paoli Pike. John Deere 4710 diesel 4WD hydrostat tractor with 460 quick hitch front loader and 1,032 hours, Ford 8N tractor, 11’ Land Pride batwing finish mower, John Deere MX6 rotary mower, John Deere box grader, post hole auger, grader blade and Poulan Pro 26HP riding mower. 1988 Ford F150XLT 4WD V8 camouflage pick up, runs good. Great for hunting or on the farm. Husqvarna 445 chainsaw, Stihl mini tiller, Shindaiwa T242 straight shaft trimmer, Fradan gas powered push blower & trimmer, floor jack, fuel tank, hand, yard and power tools, hand truck, ATV ramps, ladders, electric power washer and more. Green painted wood berry wagon with 2 iron wheels, oak ice box, library table, James & Polk Plaboy portable record player, dinner bell, duck weathervane, bottle capper, 10+ large foundation stones, wicker settee glider, stone jug, cast implement seat stool, excellent wood carpenter’s bench, round John Deere thermometer, horse drawn plows, iron wagon wheels, old door, well pump, vintage tools and many other farm related items. Big Green Egg XL grill, Weber charcoal grill, Schwinn Airdyne exercise bike, cooler, coleman lantern, trouble lights, lawn chairs, glassware and more. Hwy. 150 to Paoli Pike. East 1.5 Miles to left on Scottsville Road. 5 Miles North to auction on right. Located just 1/3 Mile North of Scottsville Navilleton Road and across from Scottsville Christian Church. Plenty of parking.